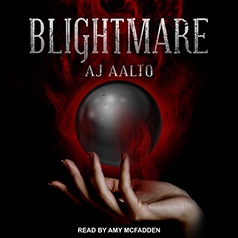 AJ Aalto presents Book 5 in the Marnie Baranuik Files series. That is, until the Blights descend, and Marnie realises that all her nightmares are about to come true. Running with a lighter crew and a busted heart, can Marnie get her act together and solve the riddle of Beau Boudreaux before the End Times come a'knockin'? Or will the Blightmare become her new reality?